Congratulations on cooking all the way through the book! That is a big accomplishment. It has been a treat to cook along with you. Bittersweet indeed! Glad this was a hit at your house and yes, it’s nice to have the extra weeks to reflect! This was such a fantastic journey and I have enjoyed cooking along with you. I can’t believe it is over, but I will always remember all the friends I have made along the way. 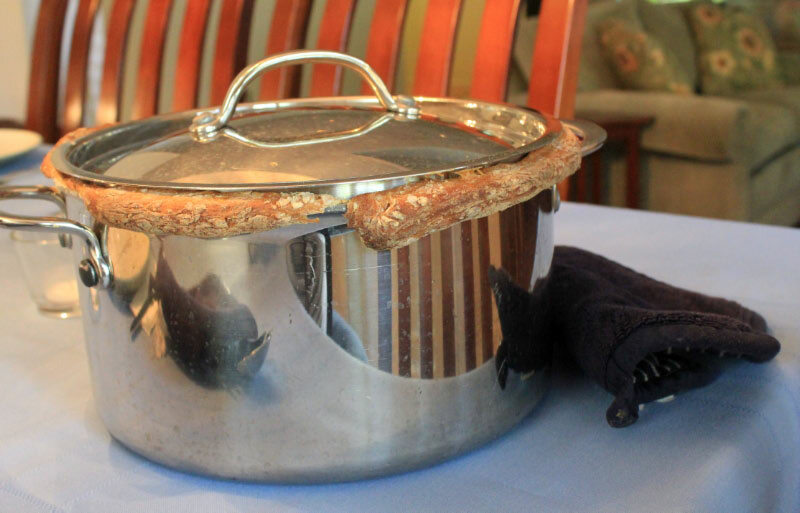 Oh, by the way, your chicken in a pot looks so tasty. Have a great weekend. It has been fun, hasn’t it!?! 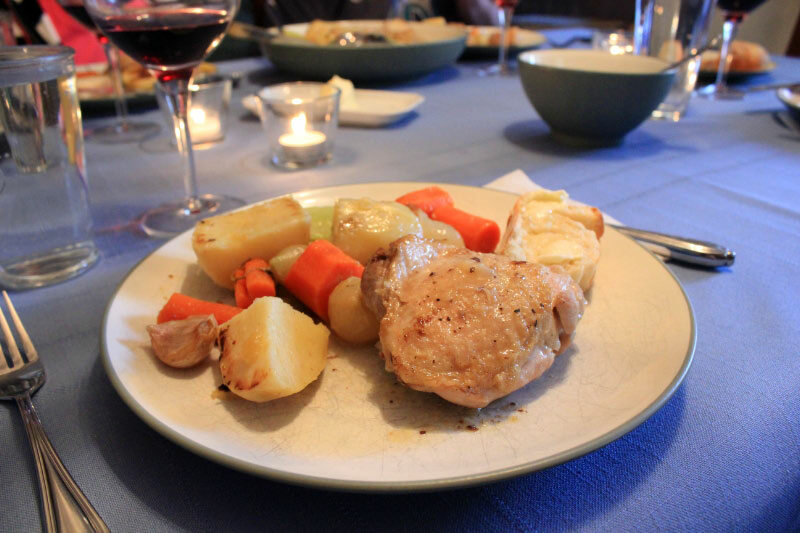 What a perfect comforting meal to share with your family. We’ve shared many FFWD meals with my brother & sister-in-law who are probably wondering if we’re still going to feed them. It would be lovely to meet you in person one day. Mmmmm.. the garlic on fresh bread! Brilliant idea! I made this at the last possible moment after arriving back in town from a work trip – so most of the results are snuggled, deconstructed, in the freezer, waiting for a different day. 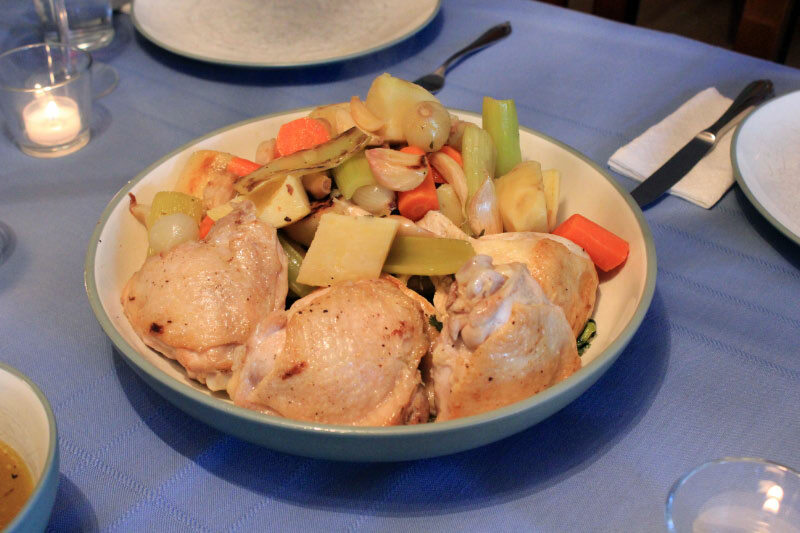 But it was delicious, and I’m looking forward to using the chicken and sauce in some yummy dish – and the bones for soup! I’m sure this was a perfect meal for your family! How lovely. Hope you enjoy your weekend! I’m glad you thought this was a good one to end out. It was the quintessential AMFT recipe, wasn’t it? I’ve enjoyed cooking with you throughout this journey. The end of the book is bittersweet. I think the community won’t end though. Dorista friends were the best part. Karen, congrats!! That’s amazing that you did all the recipes! I’ve enjoyed following along with you a few years ago and upon returning as well! Looking forward to the next few weeks. Your parents are indeed blessed with their timing – this was a delicious dish to share with them. It has been a amazing journey, so delighted to have cooked along with you! Congrats on completing all the recipes! I have about 15 to go…some I may never make up! This was a delicious dish…yours looks lovely! It is nice to end on a high note! Your chicken looks great and how nice that you had it to share with your parents. You are one of the few to complete all of the recipes. Congratulations! Congratulations on the completion of all the recipes from the book! 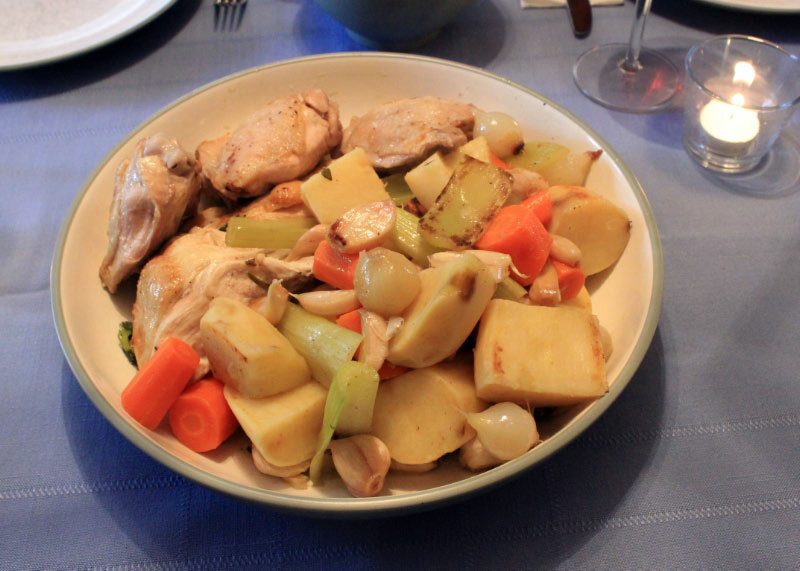 And your Chicken in a Pot looks utterly delightful, perfect dish for sharing with family! Congratulations on being a member for the 4 years. Maybe we will see each other over at TWD. I am glad that you all liked the garlic on bread too. My crowd did not like it but I did. Have a great week. Congratulations on cooking all of the recipes! And I’m so glad the final one was a hit for you and you were able to share it with your parents. We really liked it, too. Now, on to the retrospectives (and boxes of tissues).